SAVILE ROW STYLE MAGAZINE, Vol 1 No 1, the first issue of our print-on-demand publication, will be available to order from December 20th. 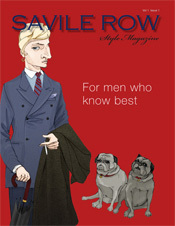 Go to www.magcloud.com and enter Savile Row Style Magazine. A magazine will be printed and mailed to you - a bespoke service. And during the month of December, the printers offer a goodwill reduction on all orders of 25%, so be sure to order before the 31st. As one of the first print-on-demand publications in the UK, this is to meet demand from readers of the website, who have asked for a magazine that they can keep and read at their leisure. It will carry the same features as online but with some additions, further illustrations and some special offers to come. d.b. or not d.b. that is the question. Men have always decorated themselves with jewels and accessories, says top jeweller Stephen Webster. feminine-friendly approach, with a glam orous display for the festive season. The best of bespoke footwear by new and old craftsmen shows British tradition of fine shoemaking is alive and well. Luxury development of classic Nash buildings in Regents Park demands all kinds of London and UK-wide art and craft supplies. Young entrepeneur meets increasing demand for better wines and offers luxury trips to the chateaux. Chittleborough & Morgan inherited the Tommy Nutter mantle that transformed Savile Row in the 60s. ...and lesser mortals, and passionate about fine textiles and bespoke shirts, Frank Foster is the master shirtmaker. start as sheep graze in Savile Row. Left, standing by for the stampede; right, the rush hour. Glittering party at Mayfair jewellers that made the famous skull. and other environmentally sound travel. Style 4 - London top centre for fine property - and arts. will be available on a bespoke print-on-demand basis.